Ahh, the beach… the sound of the waves crashing to the shore, the wind in your hair, the sun on your face and the sand; who doesn’t love a vacation by the sea – well, we don’t. Born and raised in Miami, Florida those are shocking words I never thought I would say, but I have learned that sand and wheelchairs don’t mix. As a child while sand had some redeeming qualities, like building sand castles or burying your brother in it, in reality, sand was annoying, especially when it got in your eye. As an adult it mostly irritated as it mysteriously made its way into crevices previously unreached but as a chair user this previously manageable surface becomes detestable. Typically, my husband and I try to avoid the beach at all costs. But one time we were visiting my hometown with some friends and thought we’d brave it since I had some extra help. Just so you can get the full visual effect, let me describe what it normally looks like when my husband and I go to the beach. We load up our gear, jump in our car and drive as slow as it takes with our heads sticking out the window for a better view, till we find the location with the absolute closest pavement to water ratio and make a bee- line for it. We park unload the gear and head to the pavement. When the pavement runs out, my husband takes one push into the sand and his casters go about 4 inches under. We then proceed to dump all of our gear in the sand while I pull out a towel and my husband transfers to it. Then we make the ‘however many feet’ pull/ drag/ push with him on a towel scooting with his arms while I pull/ drag the rest of him until we reach our prime beach going spot. Which means we have left all of our stuff, and his very expensive chair, just sitting there, out in the open until I get him to our spot and I can run back to get our stuff. So now that you have the visual you can better understand the ordeal that we were preparing to do in Miami for our friends. Though the thought of having friends to help definitely made it seem more appealing. We were walking down the sidewalk trying to eye that perfect aforementioned ratio when one of those fitness jocks who obviously lives at the beach showing off his chiseled bronzed pecs walked over to us and said (please insert best muscle man voice here) “Hey, they have free beach chairs over there at the office”. Who said Miami was lacking in its southern hospitality? So we walk over to the office and sure enough in exchange for his chair they would lend us a beach chair for the day free of charge. While the thought of leaving his chair in someone else’s hand made me nervous, we decided to go for it even though it didn’t seem like an even exchange. If something happened to their chair we borrowed it would simply be unable to rent for a bit, but if something happened to my husband’s chair I would be giving him piggy-back rides everywhere until we could order a new one, which by the way would be physically impossible for me. But those were their rules and so we followed them and we got to enjoy a fabulous day at the beach. My husband was even able to easily get to the water. Though he wasn’t so fond of me being in control of where he went. 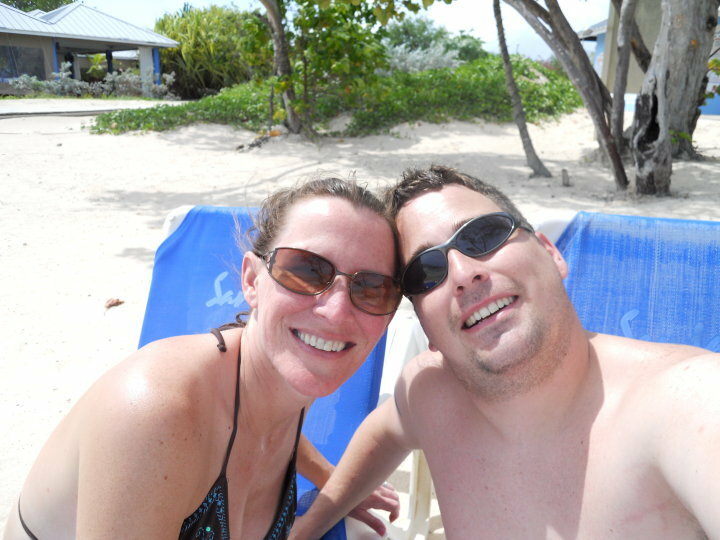 One of our funniest beach experiences was on our honeymoon. We stayed at one of those all-inclusive resorts in Jamaica. We couldn’t have asked for better accessibility (minus the fact that he couldn’t close the bathroom door with his chair in there – talk about a quick reality call to no more privacy). But the staff went out of their way to make things more accessible for us. In fact, one night we were perusing the dinner options for the night and saw that they were having a buffet on the beach. As previously mentioned we avoid sand at all costs so we weren’t planning on staying but I decided to walk over and see what they were having. By the time I got back to my husband to share what I saw, the wait staff had set up our own little table on pavement complete with table cloths and silverware. 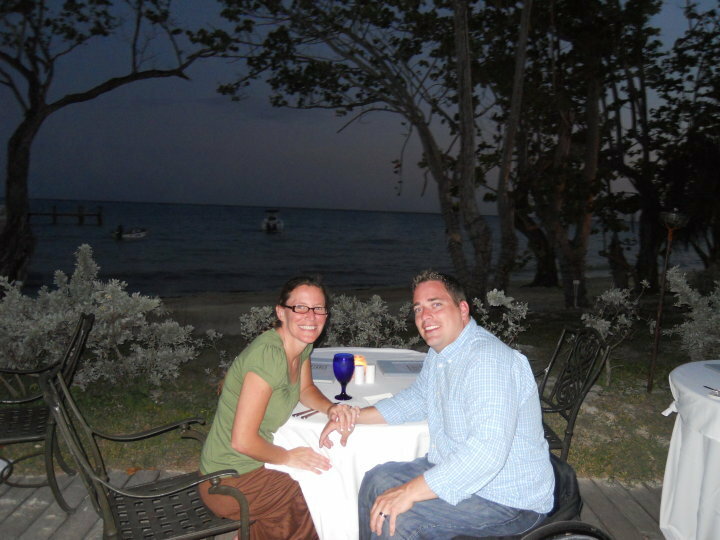 That night we enjoyed a lovely candlelight dinner by the ocean! While at this all-inclusive resort, we spent most of our time by the pool, but one day decided to venture out to the beach. So we proceeded with the aforementioned towel drag/ pull through the sand to the water. Typically the beaches were empty as they were when we got there but apparently some watch guard must have put an A.P.B. out on the ‘guy in the chair’ because by the time we made it to the water, three lifeguards were standing watch over us. They even joined us in the water watching my husband like a lion ready to pounce on his prey. I assured them that my husband could swim very well in fact and that I, too, was a trained lifeguard but to no avail as they continued to stare from their posts. So after about 5 minutes of feeling like we were actors in the Truman movie, we decided we had had enough and started to head back to the less ‘like baby-sitting’ pool. When we got to the sand the lifeguards descended like vultures. I didn’t even get a chance to attempt the towel drag/pull scenario. With no words exchanged to us the three guards swept him up in their arms carried him to the dock where they proceeded to shower him off while I stood idly by (possibly laughing). When they started to towel dry him off we decided to put an end to it all and told them we could handle it from here… and just like they appeared, they disappeared into the beautiful sun shiny day. Later we were told that they, too, had a free beach chair and instead of having to check it out every day we could just keep it with us for the duration of our stay – though after our initial beach experience we decided to stay away from the beaches for the rest of our trip and stick to the pools! All in all a place with sand is not somewhere we choose to go. But occasionally we are surprised with the local hospitality when we do venture to the beaches. And on a final note if you thought sand getting in all the wrong crevices was bad as an able- bodied adult, it is multiplied 10-fold as a spinal cord injury that has to drag his body through it! When we were in Kauai, the lifeguards ran the beach wheelchair (with me in it) under the shower – I felt like I was going through a carwash! Enjoy reading your blogs. You and Raymond are an inspiration. And, by the way we missed you at our Pullen Christmas party. My daughter thinks you are just a figment of Ann and Raymond’s imagination!!! Ha! Happy New Year!